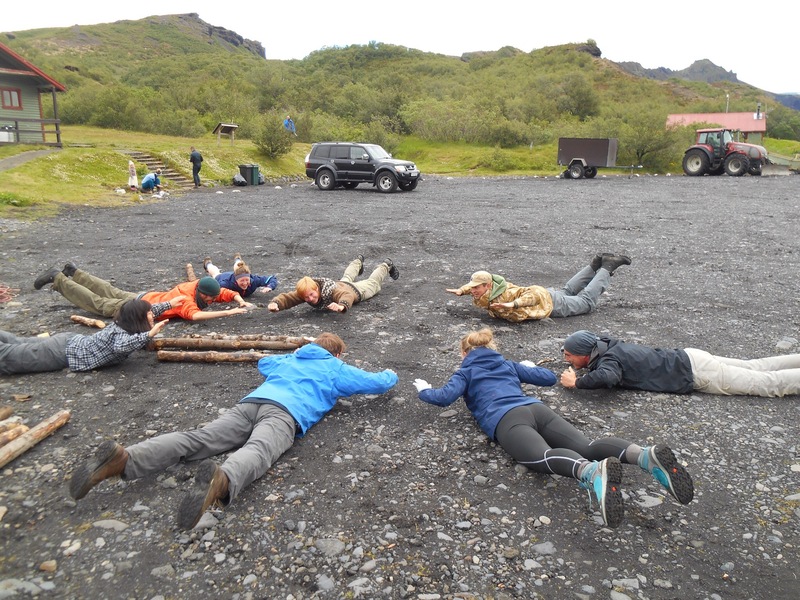 With the final two weeks at camp commencing we would be joined by new 2 week volunteers and the teams would swap, team Langidalur becoming team B’asar and a chance to work on new trails. 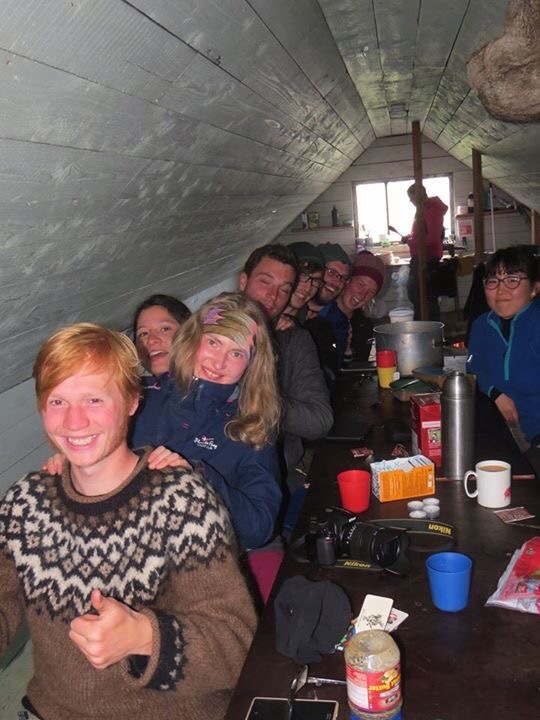 On Saturday night the teams came together temporarily in Langidalur and lazily evading temporary tent construction, Kylie, Cal, Fred and I piled into Fred’s 4 man canvas palace for a night. The garlic bread Maria had made for dinner caused a new kind of breathy cloud to hang over our tent and we slept soundly and snugly under the pitter patter of raindrops. New arrivals meant new excitement as we met our 5 new volunteers from the bus on Sunday. 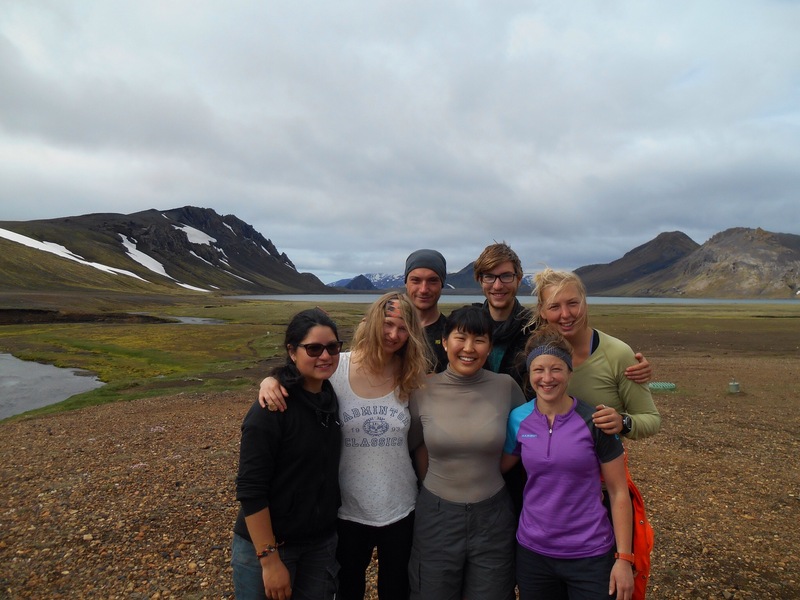 Representing Russia, Wales, Mongolia, America, France and Scotland, they breathed new life into an already vibrant camp. They included Kylie’s brother Connor who would travel with us on as well. Holiday week had provided a chance to better get to know the volunteers who had been working across the river so when it came to the week of work ahead, we were excited to get started but certainly sad to cross the bridge. B’asar camp where I would be based was a lot simpler than Langidalur base. The camp was scattered through the trees with wild flowers and pocketed glades making it a picturesque place. Luxuries like a fridge and running hot water were a thing of the past and laundry became an even lengthier process having to boil the kettle inbetween. Monday morning we warmed up with a game of Ninja and then headed to the woodpile to collect the resources for the weeks work. 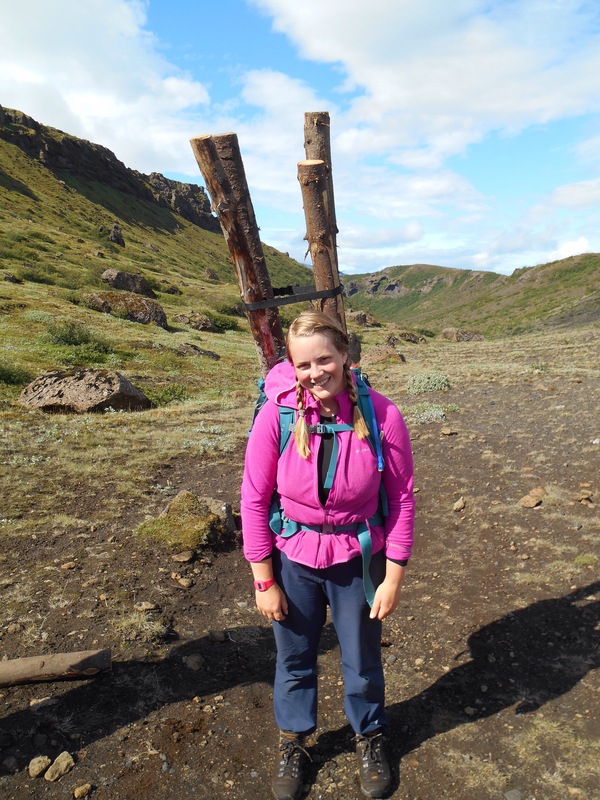 With much of the work being in Rjupnafell, the day’s adventures included 2 trips to the mountains base with 2metre logs on our shoulders. Each trip was a 10km round with breathtaking scenery and plenty of biscuits. Last minute it appeared that the rumoured ‘super long range’ trip was on the table commencing Tuesday, the very next morning. 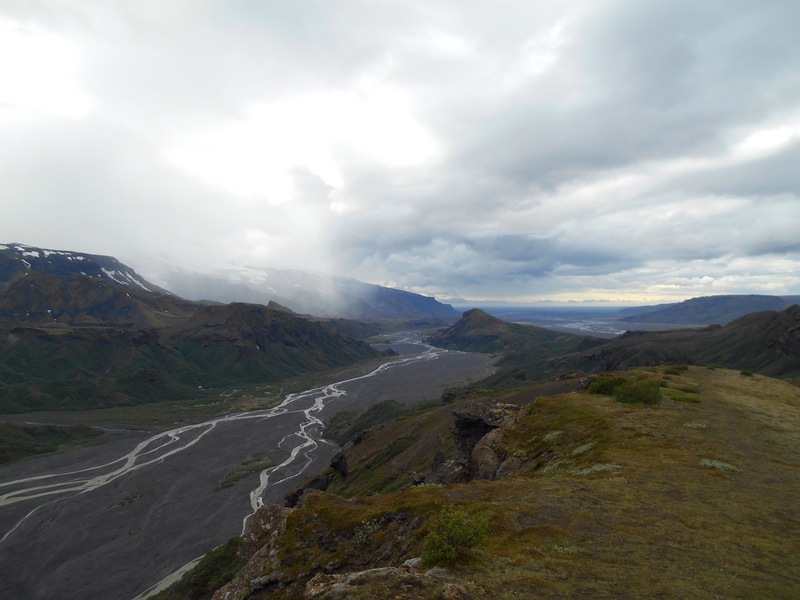 This would be an opportunity to work on the Laugavegar trail, a 56 km multi day hike from Thorsmark to Landmannalaugar in the highlands. Despite the imminent long walk, everyone jumped at the chance and teams were revealed Monday evening. 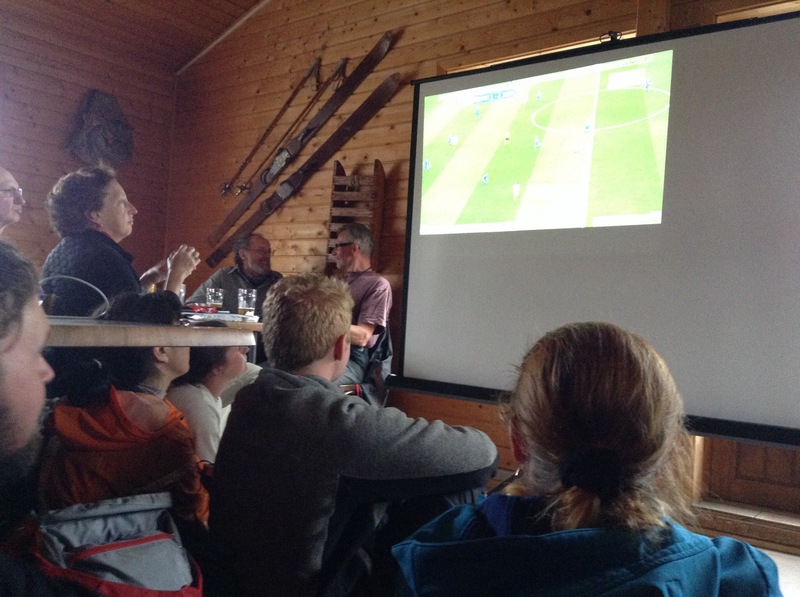 I would be part of the first group to take on the new challenges further up the trail but far from getting prepared, we all headed to Husadalur to watch the Iceland vs England game. Feeling very unpatriotic after a gutting referendum result there was no one gunning for England and the small cafe with maybe 100 spectators roared loudly for the Iceland goals. Cross legged on the floor we watched the game in tense excitement as the tiny country making its premier in the Euros knocked England out. It was a scramble to get the tent down, get packed and showered and out of camp for our adventure. There was 11 of us setting off, a cross section of old and new from both camps with a 28km hike to gel into a tight knit team. We started with a stretch circle and then With good weather we marched on singing, sharing jokes and obliterating hills. We passed the two previous long range camps, persisted up ‘horrible hill’ to Emstrur hut which marked 17kms. 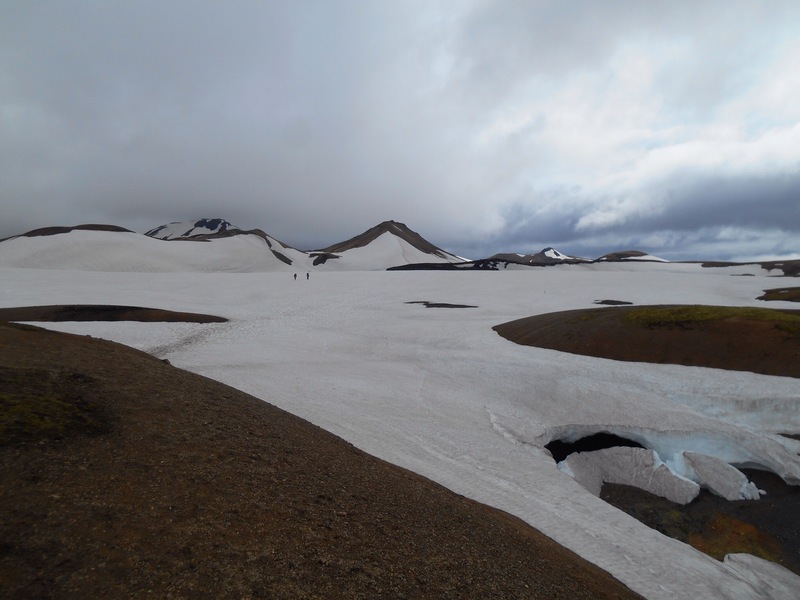 The weather turned as we emerged onto a plateau with snowy mountains on either side. The volcanic stone made for a nice final walk. Just when we hit an energy low, Maria appeared with a packet of biscuits and the message that we were only 20minutes away. 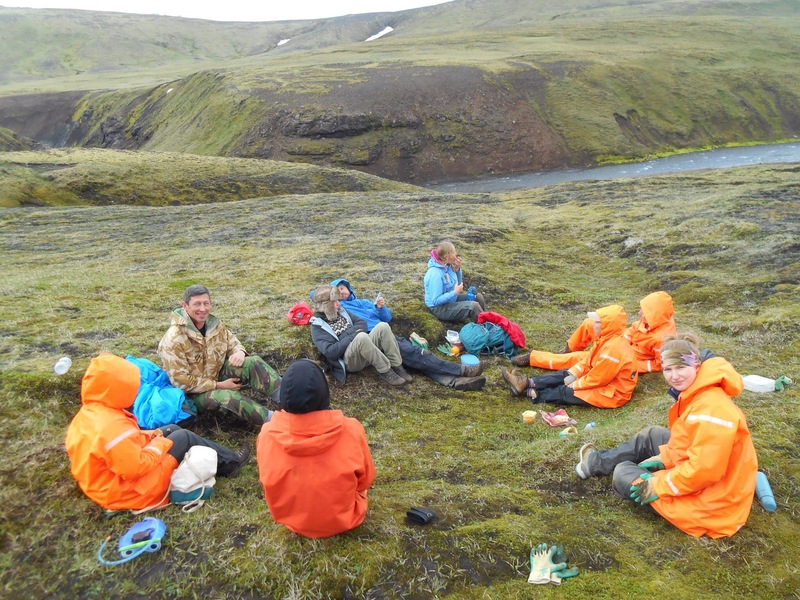 Our base however was just the other side of a thigh high fast flowing glacial river. For the second time that day we put on our river crossing shoes and in lines of three braced ourselves against the current and the cold and crossed. 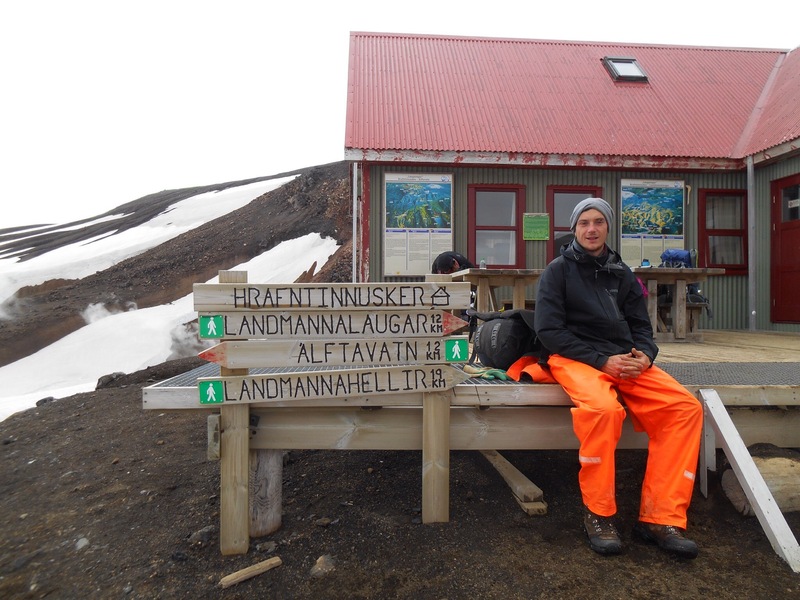 Far from the normal long range we were to be based at Hvangil, the second hut. We would camp but have use of a toilet and exclusive use of the stables to cook and shelter inside. Cat and Maria had been preparing the site and we arrived to find hot drinks, a sparkling clean room and dinner almost ready. We relaxed quickly into our new tent spots surrounded by textbook mountains and I slept top to tail with my new tent mate, Sarah, not so easy for her in a tunnel tent! Wednesday started well with a scramble for porridge and then we gathered for stretch circle. 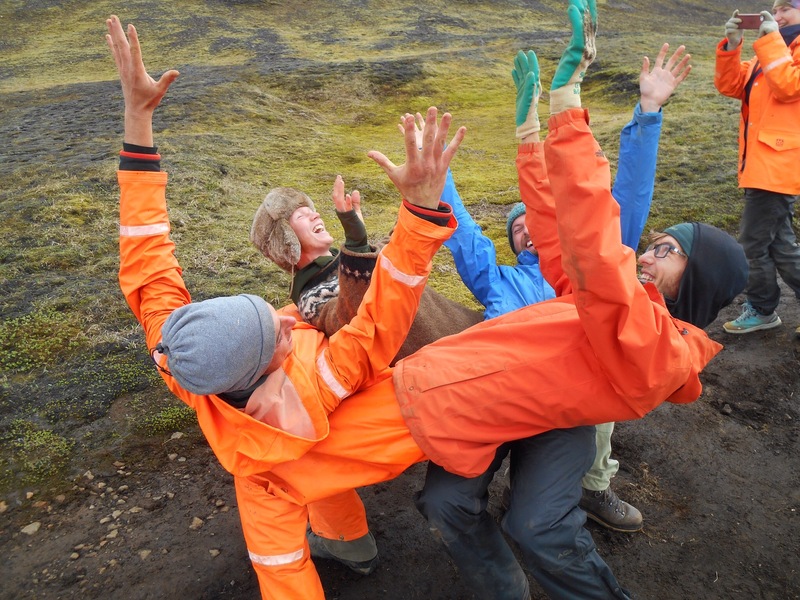 Whilst we each answered the question of the day, ‘What is your dream road trip, form of transport and with who?’ we shared a stretch with the group to ease our aching bones and then headed up the trail crossing a few patches of snow to get to our work site a few km on. 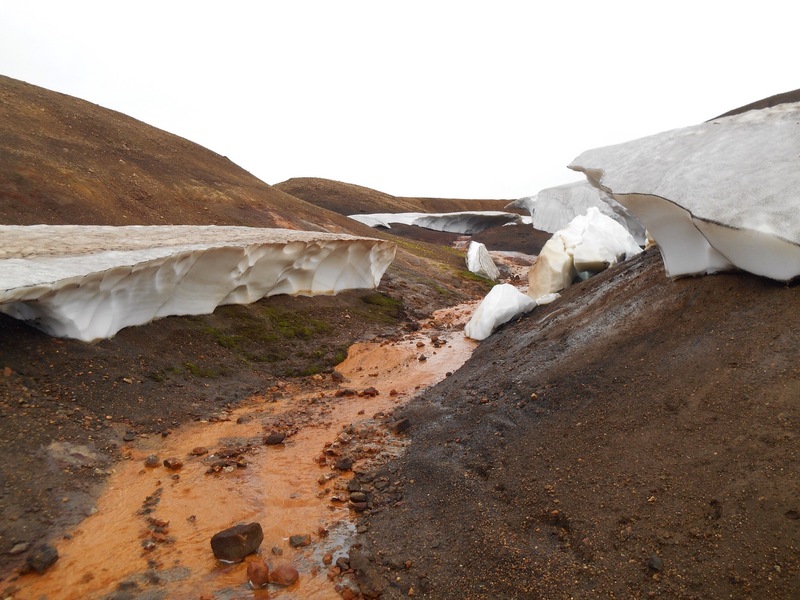 This site, so remote to either trail teams, has never really had any attention and gullies had formed to enable run off. 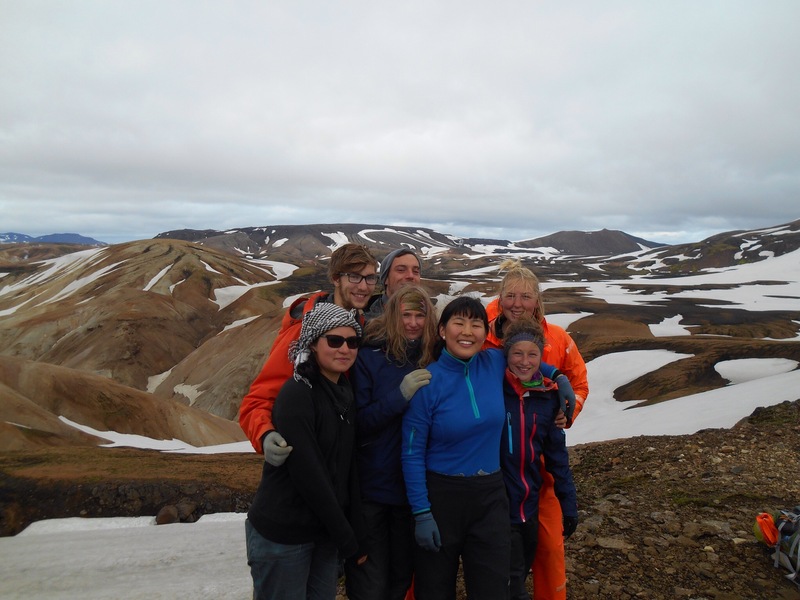 With the group of eleven splitting down into three, we even found the weather was not uniform between our sites, less than 10 mins apart as each mountain determined the fate of its valley. Our team would be filling in a sizeable gully and building some new earth drains. We were stationed just above the third river crossing, a pooling point for hikers in both directions to stop and squeal as they crossed. Laden hikers looked twice as they passed us, them half way through their trek, us with buckets of rock ferrying up and down the mountain side like ants in a production line. 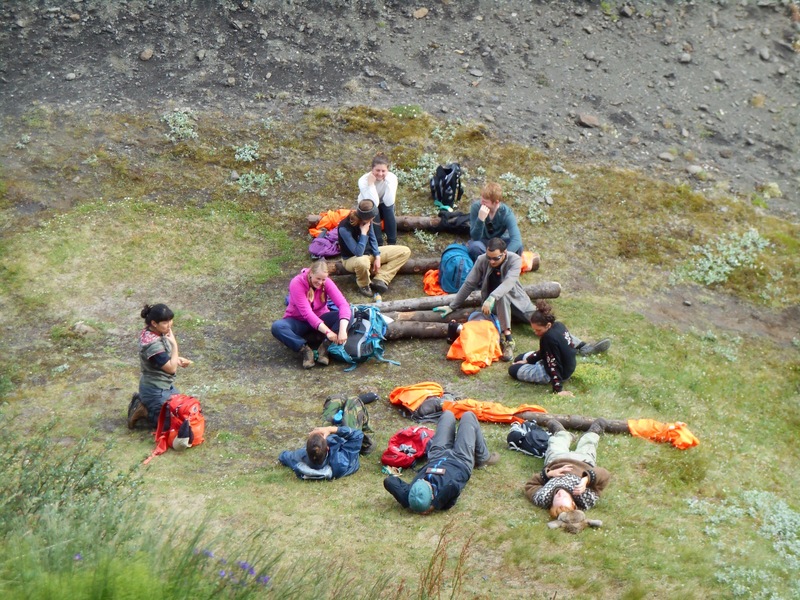 At lunchtime we congregated in the middle for sandwiches and after a good feed all fell asleep comically on the side of the hill. 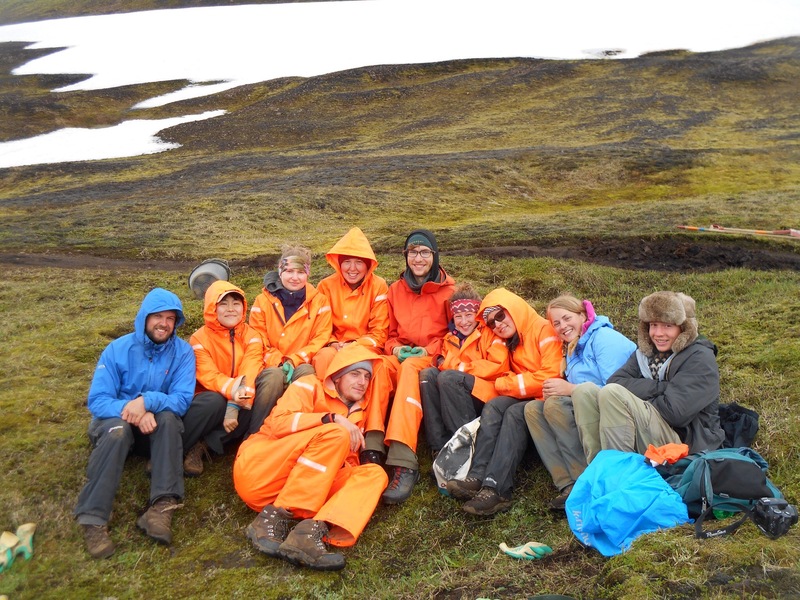 With five minutes left of our lunch break and in stark contrast we all lept up and ran up the snowy hill to slide down on our bums in our heavy duty orange overalls. With the sleep shaken off and snow in our boots it was back to digging and ferrying for the rest of the afternoon. With the stables to relax in each evening we found new ways to entertain each other in the evenings. I took to giving a dramatic poetry reading from Roald Dahls revolting rhymes and soon they became a heavily requested evening activity. An offhand comment about achy shoulders turned into a massage train which involved the whole group and out proved our expectations when it lasted 20 minutes. We also got stuck into a few games of mafia and things got personal as we killed each other off and accused each other of looking dodgy. In the morning our production line of three grew to accommodate seven people as we aimed to rid the path of stones further up and fill in our gully on the next valley. With one person filling buckets the rest of us stationed ourselves 100metres apart and swapped empty buckets for full to complete the chain. Soon rocks were not the only things travelling up and down the chain. Jokes started at one end and returned for the punchline, the knock knock joke being the most satisfying. Chinese whispers joined and soon presents of rocks and flowers made their way up and down the line. In the afternoon much effort went into beautifying the newly filled in gully and digging earth drains to take away the excess water from the trail. On higher ground the winds ripped through the campground at night shuddering the tent. Friday lunchtime was full of frivolities as we played many team games such as Ninja and a game which involved us all grabbing someone else’s hands and then aiming to undo the knot we had got ourselves into. I’m not sure what the passing hikers thought to 10 adults giggling as they crawled and climbed out of each other’s arms. At the end of an amazing week Chas came to collect those who weren’t going to continue to the end of the Laugavagur trail and the rest of us prepared for a long hike in the morning. Saturday morning meant it was time to move and we passed our work and onto the third river crossing. Just beyond was Altavatn, a hut situated on a large lake and surrounded in every direction by snowy mountains. In the morning sun the lake was tranquil and reflective. 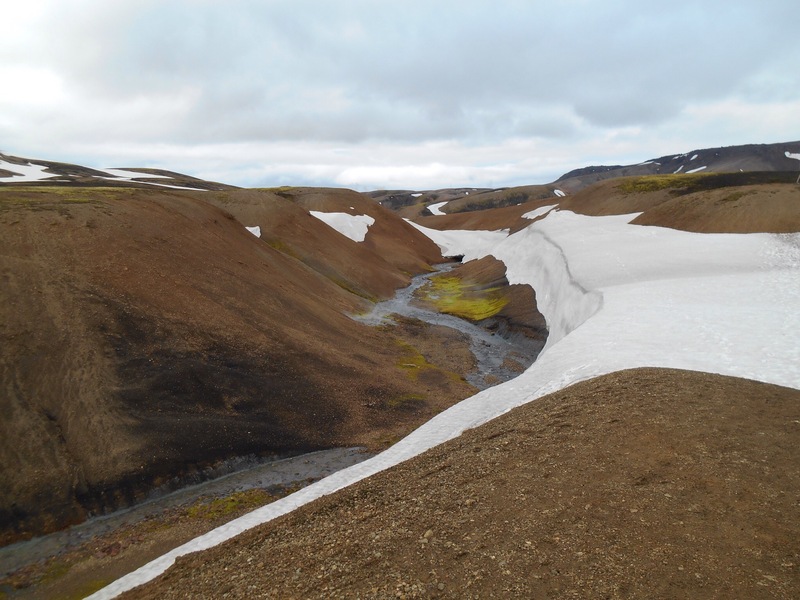 From here we snaked and crossed ice bridges before hitting the mountain where steep switchbacks helped us gain 400 metres, drench ourselves in sweat and give us a rewarding lunch spot from the top. At our new altitude we truly felt like we were in the highlands. The air was cooler and we passed through snow as we climbed up and down the ridges. 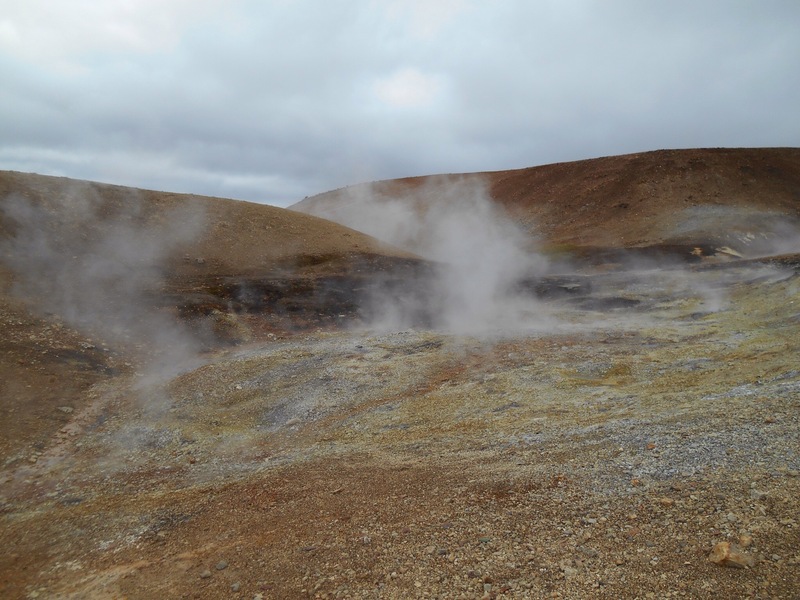 Now we were truly aware of the geothermal activity. 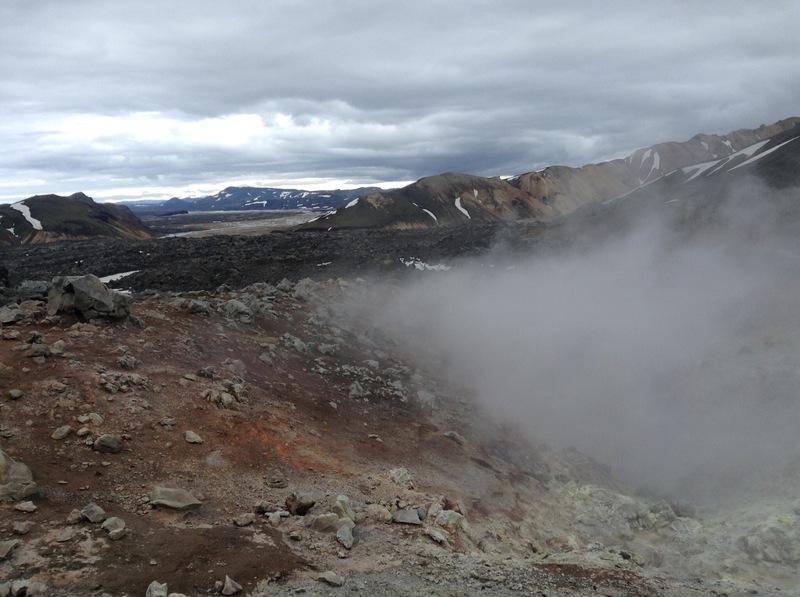 The ground was steaming, the sulphur smell adding to our unwashed socks. The streams bubbled and marvellous colours marked the landscape. 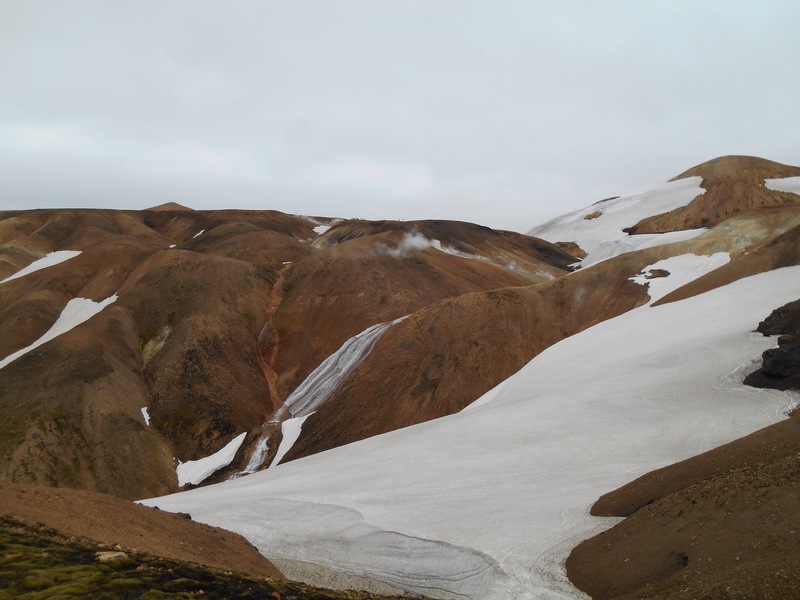 The thick layers of snow were shaped by spiralling steam leaving the vents and every step brought new things to our attention. The highlight of the day was by far the vast amount of sliding opportunities as we crossed large snow plateaus. 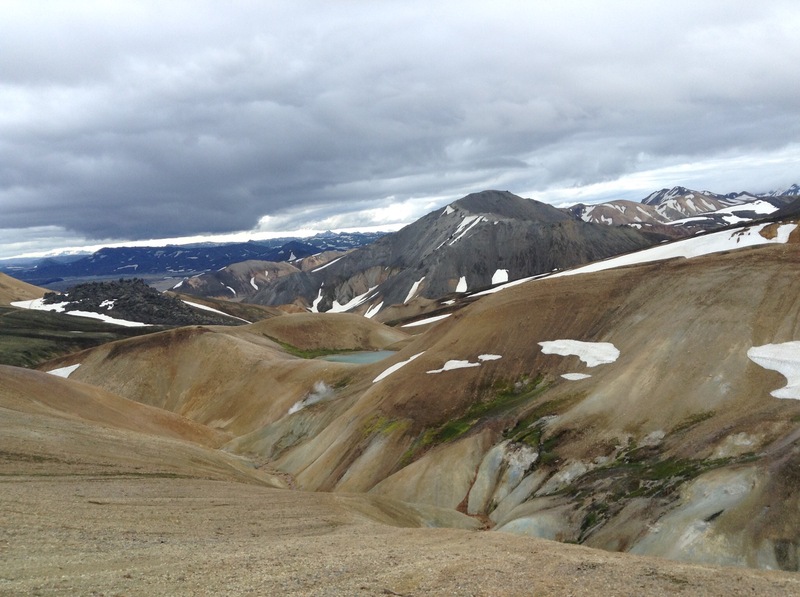 The snow proved a tiring challenge but made for a beautiful landscape as we climbed ever up. 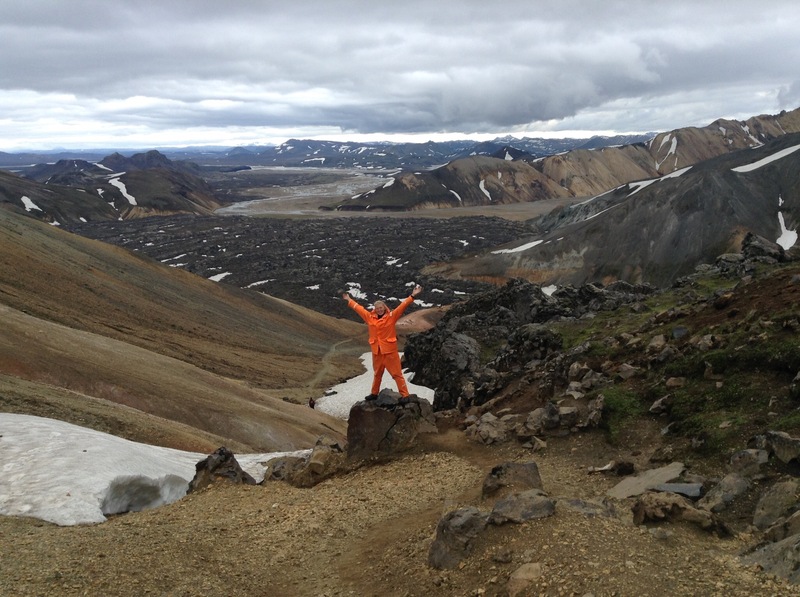 Just as we neared the end the trail revealed its final secrets, a vast lava field where eerie shapes and figures lurked. 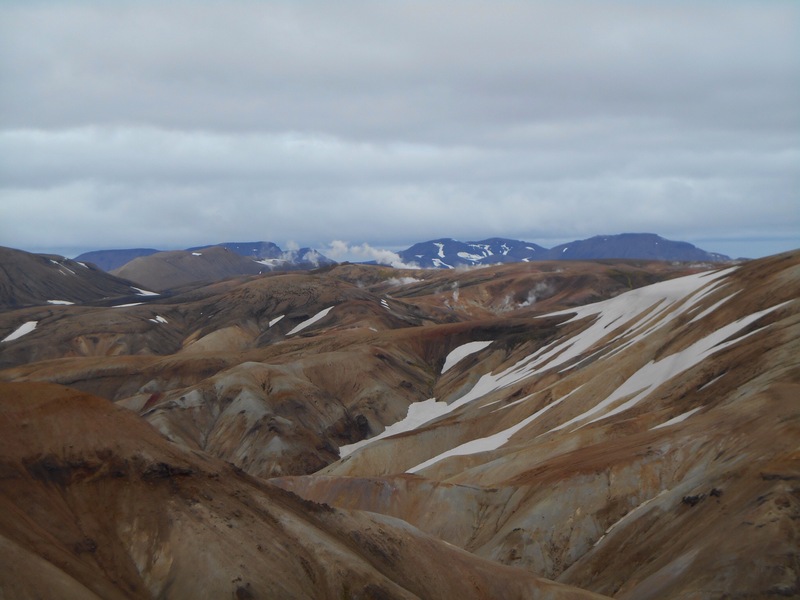 The mountains here were multicoloured like something out of a child’s drawing of another planet. Euphoria and leg ache were the overwhelming feelings at the end of a great day. 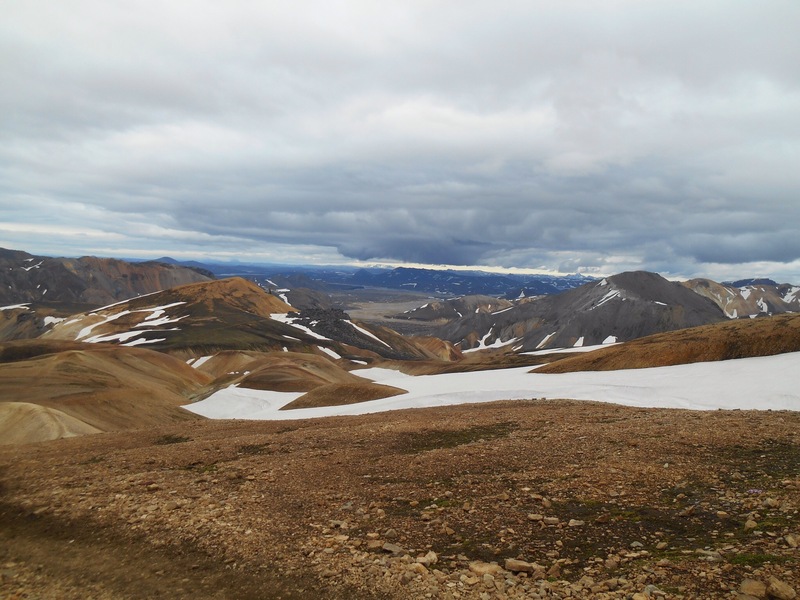 Landmannalagaur was a busy camp set in greenery surrounded by hills with the stripy remnants of snow. Greeted by the morning sun we made our way into the outdoor hot pools. Actually you sat in an outdoor river fed by a hot stream. This meant a difficult adjustment process whereby your body was often experiencing the extremes of hot and cold, where any small movement could cause yelps and it was fun to send surges of cold towards your neighbour. We sat in the pools until our muscles untensed and our fingers wrinkled beyond recognition. 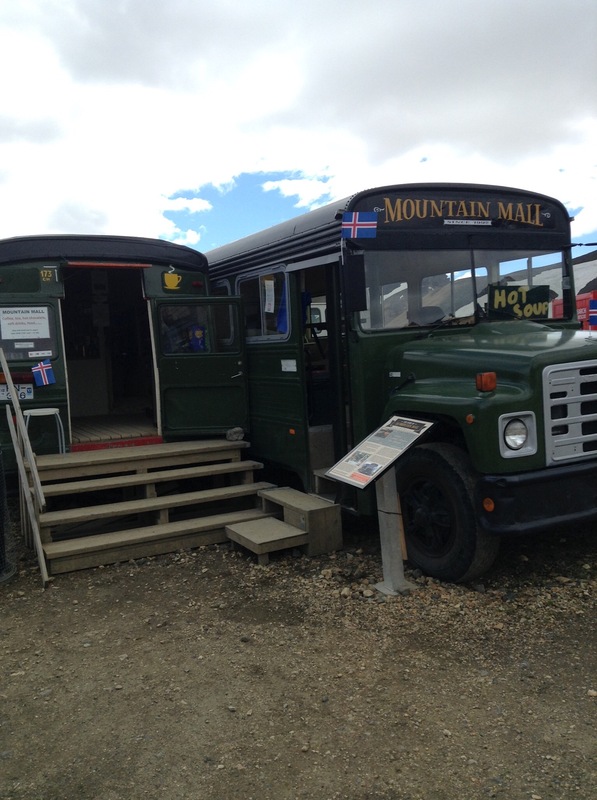 In the afternoon we caught a 4wd bus through the highlands past Hekla, one of Iceland’s volcanoes which is overdue to erupt. We got dropped at Hella at the petrol station. We had been creating a fantasy junk food shopping list and enjoyed raiding the aisles for cakes and chocolate. Overloaded on sugar we made our way back to Thorsmork for the start of another week.